herpes zoster involving the facial and auditory nerves associated with ipsilateral facial paralysis, usually transitory, and herpetic vesicles of the external ear or tympanic membrane, which also may or may not be associated with tinnitus, vertigo, and hearing disorders. Called also herpes zoster auricularis or oticus, geniculate neuralgia, and Hunt's neuralgia. 1. A condition characterized by facial paralysis, ear pain, and often rash, tinnitus, or vertigo, caused by reactivation of the varicella-zoster virus usually in the geniculate ganglion. 2. Any of several neurological disorders characterized by progressive ataxia with myoclonus. a neurological condition resulting from invasion of the seventh nerve ganglia and the geniculate ganglion by varicella zoster virus, characterized by severe ear pain, facial nerve paralysis, vertigo, hearing loss, and often mild generalized encephalitis. The vertigo may last days or weeks but usually resolves itself. The facial paralysis may be permanent, and the hearing loss, which is rarely permanent, may be partial or total. Treatment usually includes the prescription of corticosteroid drugs. Also called herpes zoster oticus. Hunt syndrome ENT A condition that occurs when herpes zoster affects the auditory nerves Clinical Intense ear and mastoid pain, facial nerve paralysis, hearing loss, vertigo, tinnitus, aguesia–loss of taste, dry mouth, dry eyes, herpetic lesions in the auditory canal, mouth, face, neck, and scalp Management Analgesics; pain may be refractory Prognosis Residual loss of function is the norm. See Herpes zoster. A painful varicella virus infection presenting with a vesicular eruption on the pinna, with or without facial nerve paralysis. Synonym(s): Ramsay Hunt syndrome (2) . 1. An intention tremor beginning in one limb, gradually increasing in intensity, and subsequently involving other parts of the body. 2. Facial paralysis, otalgia, and herpes zoster resulting from viral infection of the seventh cranial nerve and geniculate ganglion. 3. A form of juvenile paralysis agitans associated with primary atrophy of the pallidal system. Synonym(s): Ramsay Hunt syndrome (1) . James Ramsay, U.S. neurologist, 1872-1937. Hunt atrophy - obsolete term for atrophy of the small muscles of the hand, without sensory disturbances. Hunt paradoxical phenomenon - in torsion dystonia, extension of the foot in response to passive flexion and flexion in response to attempted passive extension. Treatment of Ramsay Hunt syndrome with acyclovir-prednisone: significance of early diagnosis and treatment. Hence, it would be purely speculative to consider this as part of the Ramsay Hunt syndrome. DISCUSSION: Ramsay Hunt syndrome is the second most common cause of atraumatic peripheral facial paralysis. 10) The largest retrospective Ramsay Hunt syndrome treatment study (10) showed a statistically significant improvement in patients treated with prednisone and acyclovir within 3 days of onset. CONCLUSION: The case has been reported due to its rarity and to demonstrate the usefulness of a combination of steroid and acyclovir therapy in the management of Ramsay Hunt syndrome. Goldani LZ, da Silva LF, Dora JM; Ramsay Hunt syndrome in patients infected with human immunodeficiency virus. 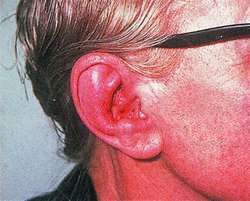 Classical Ramsay Hunt Syndrome can be associated with vesicular rash of the ear or mouth (as many as 80% of cases), the rash might precede the onset of facial paresis/ palsy (involvement of the seventh cranial nerve, ipsilateral lower motor neuron facial paresis/palsy, vertigo and ipsilateral hearing loss, tinnitus, otalgia, headaches, dysarthria, gait ataxia, fever, cervical adenopathy, facial weakness usually reaches maximum severity by 1 week after the onset of symptoms. PHYSICAL FINDINGS: The primary physical findings in classical Ramsay Hunt Syndrome include peripheral facial nerve paresis with associated rash or herpetic blisters in the distribution of the nervus intermedius(4). TREATMENT: Corticosteroids and oral Acyclovir are commonly used in the treatment of Ramsay Hunt Syndrome.